This exquisite piece of Sailor Art speaks for itself and says volumes! While we occasionally encounter dippers made of Coconut Shells, rarely do we encounter a coconut shell carved in such high relief and never before have we seen a goblet such as this! Carving of this nature is not often seen and not surprisingly so, as this was the work of a true artist. The entire surface is carved with crossed flags, a whaleship, and Neptune standing in his shell chariot, pulled by Seahorses over the waves. 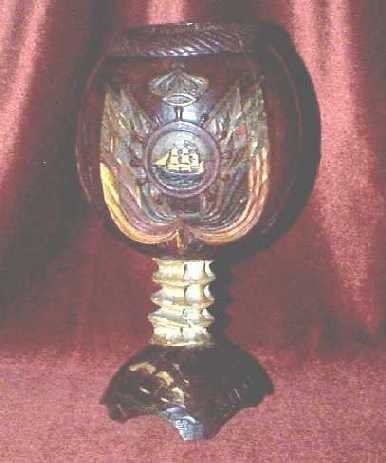 The top of the goblet is rope-carved and the stem of the piece is made of vertebrae. The base of the goblet is also highly carved and the story it tells is of a Whaling voyage that took place is 1895-96, probably to Hawaii or someplace else in the South Seas, as the base also depicts a grass hut and palm trees . . . very definitely a tropical setting. The base further is carved with a banner that appears to be perhaps the name of the vessel and the years 1895-96. This, a true rarity in the world of Scrimshaw and of "Museum Quality", a term we do not use loosely.